PNG Immigration and Australia’s Border Force are relentlessly turning the screws on Manus refugees and asylum seekers to try to force them out of the detention centre. As the October deadline for the end of Ferrovial’s Manus management contract gets closer, the government is becoming more desperate to find a way out. The detention centre has been declared illegal and the contract for running the centre is ending but the government has nowhere to resettle the refugees, or the hundreds of asylum seekers still unprocessed or denied refugee status. Despite the US resettlement deal, it is clear that hundreds are going to be left behind. Yet the government is ratcheting up the pressure on Manus Island. In late June, another notice was posted inside the detention centre warning asylum seekers that they have until 31 August to agree to return home, if they want to get the $25,000 bribe paid to those who agree to return “voluntarily”. To try and make the point, the notice is headed in bold “Manus RPC will close in 123 days”. Border Force has already gone to extraordinary lengths to pressure refugees since announcing that Foxtrot compound inside the detention centre would close by the end of June. Twenty-eight refugees were forced to relocate when N block (inside Foxtrot) was closed at the end of May. But they found other places in Foxtrot and other compounds. Refugees who moved into disused medical buildings adjacent to Foxtrot were also forced back into the compound. These buildings have now been partially demolished to prevent them being used again. Since then, the gyms in Mike and Oscar compounds have been closed so there is even less to do inside the Manus prison. Now Border Force has effectively shut down the canteen. Only phone cards, pens, and cigarettes are still available. As Solidarity goes to press ten refugees who moved out of Foxtrot a month ago are still living in the disused Charlie Compound. Despite the threats of eviction and to cut off the power, their electricity is still on. Immigration is also stepping up the pressure on individual groups of refugees to move to the separate transit accommodation centre at East Lorengau, near the main town on Manus Island. Despite being told that moving to Lorengau would not interfere with any offer of resettlement in the US, Immigration has been demanding that people in Lorengau sign papers agreeing to be resettled in PNG. 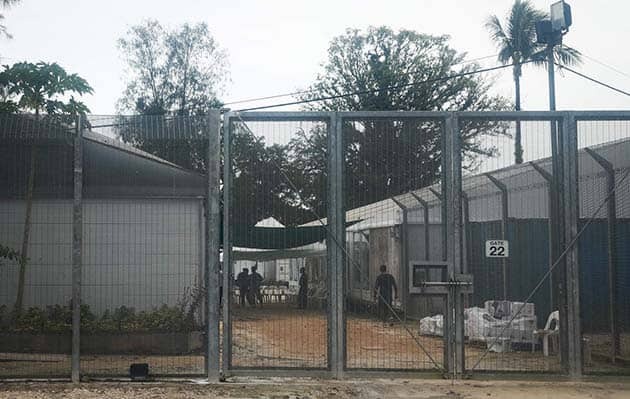 Two refugees at East Lorengau, who had been asked to sign for PNG resettlement, moved back to the detention centre last week, but were arrested by police inside the centre and taken back to East Lorengau. There are just 65 people in the Lorengau centre. Most of them have been interviewed by US officials regarding resettlement, but only five have had follow up medical checks. No-one believes that US resettlement is likely (Nauru refugees are still waiting eight months after their first interview) and life at Lorengau is just as deprived and even more dangerous that at the detention centre. Rations are delivered twice a week because refugees there cannot afford to buy enough food. The Australian government has agreed to pay $70 million to all those they sent to Manus Island; compensation for false imprisonment and for the physical and psychological damage they have suffered on Manus Island. It is an admission that the Australian government is responsible, but not a lot of money for four years of torture on Manus. But the money can’t buy a secure future; it won’t reunite families; it can’t buy freedom. The Australian government still owes them that. The refugee movement still has to continue fighting to bring all the refugees and asylum seekers here.